The Holiday Season is upon us and Girls in Gis got into the spirit this past weekend at Evolve BJJ in Fort Worth Texas! 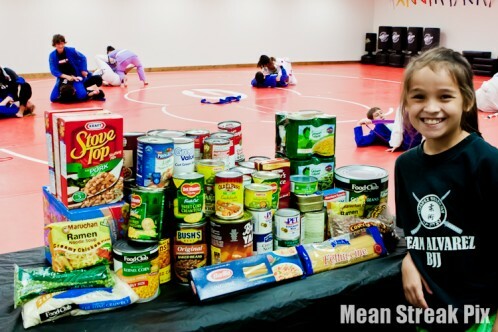 Girls in Gis members were encouraged to bring a non-perishable donation to benefit the local Tarrant Food Bank. 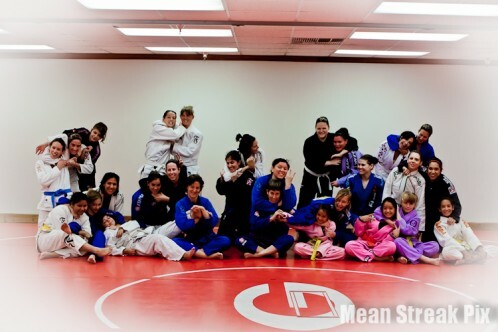 Thirty girls from academies across Texas joined together to train learn and share their passion for BJJ. Hosts Cindy Flores and Lindsey Tromble both blue belts at Evolve BJJ, were amazing hostesses and made everyone feel right at home. Sixteen year old, Lindsey Tromble, GIG’s youngest host, with the help of Cindy Flores, led the group through warm ups, drills and techniques. Tromble instructed with a keen attention to detail and confidence with the support of Flores. Tromble and Flores patiently assisted the girls and made sure no one was left behind. Together they provided yet another amazing GIG experience. `Tis the season to be giving, that’s how we do it at GIG! The generosity of our members was amazing. Together we raised an outstanding number of donations for the Tarrant Food Bank. Thank you to everyone for making a donation and contributing to a worthy cause. Kids like Lindsey, her two younger sisters and ALL of our little girls in gis are a great example of how bright BJJ’s future is becoming! Big thanks to Evolve BJJ, Christopher Story, Cindy Flores and Lindsey Tromble for letting us girls take over the mats and for making this yet another successful GIG!